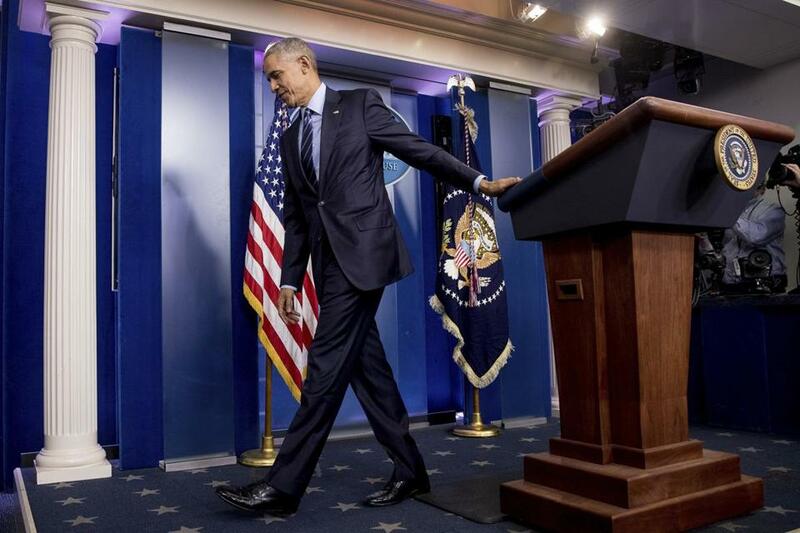 President Obama left his final press conference of 2016 Friday. Obama said he was committed to sending the Kremlin a message that “we can do stuff to you,” but without setting off an escalating cyberconflict. The president did not reveal what steps he was considering if he decided to retaliate against the Russians and suggested that some of the options, if they were carried out, could remain secret. “Some of it we will do in a way that they will know, but not everybody will,” he said. Obama made his comments at an annual end-of-year news conference, one tinged with melancholy at the impending end of his presidency, foreboding about the changes that could follow President-elect Donald Trump into office next month, and uneasiness about the role Russia played in the political earthquake that has resulted from his election. Obama also warned President-elect Trump to be less casual in his dealings with foreign leaders. Still, the president was clearly wrestling with what he said the hacking affair and the reaction to it revealed about the state of US politics. Citing a recent poll that showed more than a third of Republican voters saying they approved of Putin — “Ronald Reagan would roll over in his grave,” Obama said — the president appealed to Americans not to allow partisan hatred and feuds to blind them to manipulation by foreign powers. During the news conference, Obama also offered a long list of accomplishments that he said marked his eight years in office. But his victory lap has been attenuated by the messy aftermath of Trump’s defeat of Clinton, which has raised questions about Obama’s pre-election response to the hacking, ignited a nasty squabble between Trump and the nation’s intelligence agencies, and left a residue of suspicion over the election itself. The president continued to defend his cautious approach to reports of hacking — an approach that has come under criticism from Democrats after it emerged last week that the intelligence agencies had concluded Russia was trying to help Trump win the election. The president, however, is likely to face further questions after his CIA director, John O. Brennan, issued a statement Friday disputing reports of a rift between the intelligence agencies and the CIA over Russia’s motives in hacking the DNC and handing over e-mails to WikiLeaks, which released them in the weeks leading up to the vote. That statement will also challenge Trump, who has seized on reports of an interagency squabble to undermine the credibility of the hacking findings. He has criticized the CIA analysis, saying it was supplied by the same agency that provided erroneous intelligence about Saddam Hussein’s weapons of mass destruction before the Iraq War. Obama held out hope that when Trump takes office, he would take a more sober approach. He said he had had “cordial” conversations with his successor, and that Trump had listened to his suggestions about “maintaining the effectiveness, integrity, cohesion of our office, our various democratic institutions,” though he was not specific. That was nine months after an FBI agent had first contacted the Democratic National Committee with evidence that a major, government-linked hacking group was inside the committee’s networks, raising the question of why it took so long for that news to reach the president. 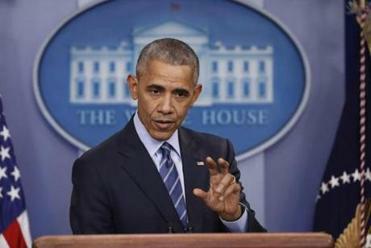 Obama made it clear that he went out of his way to play down the news, because “in this hyperpartisan atmosphere” he did not think he or anyone else at the White House could talk about it without risking to appear to be acting on behalf of Clinton. But the unintended result, as some of Obama aides concede, was that the Russians faced very little resistance. Not until September, when Obama pulled Putin aside at a Group of 20 meeting in Hanghzhou, China, was the Russian leader given a warning directly from the United States.